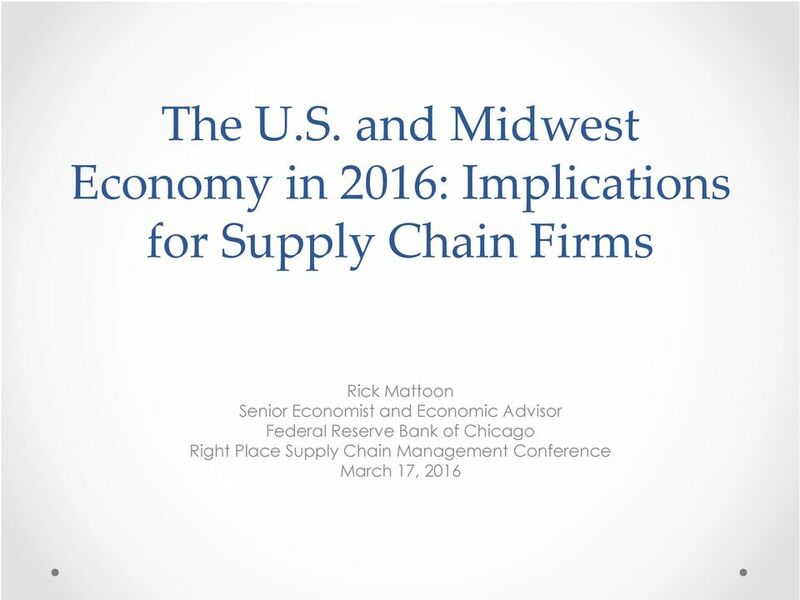 Download "The U.S. and Midwest Economy in 2016: Implications for Supply Chain Firms"
3 The argument for why the economy will grow faster in 2016 Employment. 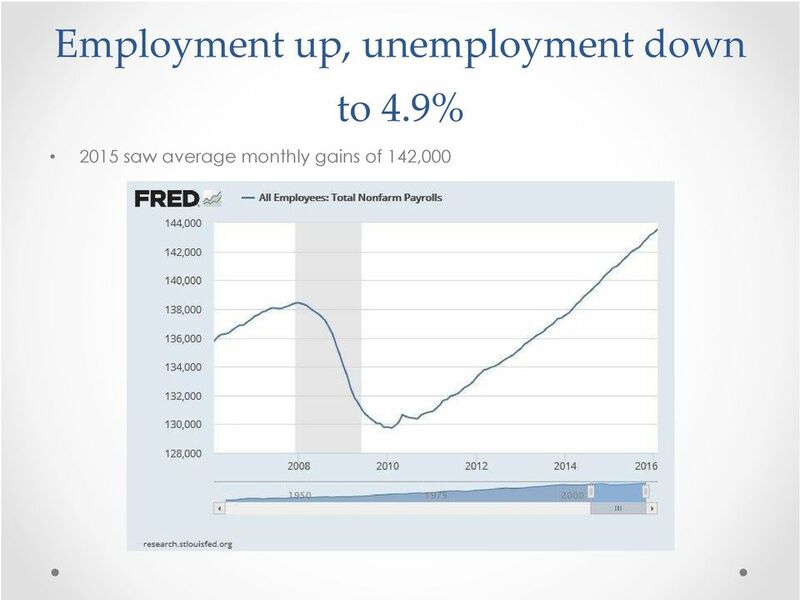 Job gains have been strong (200K+)and the job mix is improving. 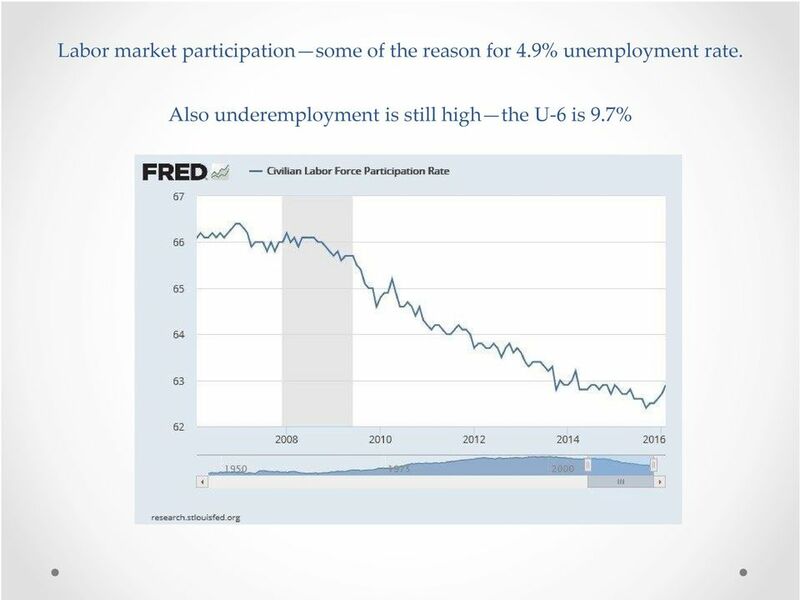 Tighter employment is finally lifting wages. 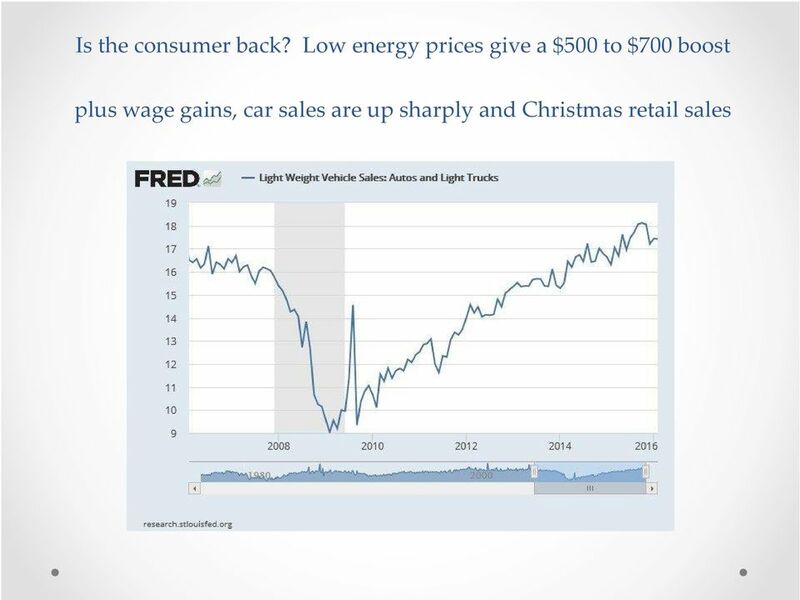 Higher wages coupled with a sustained decline in energy prices will lift household income and consumer spending. A Mastercard report found that holiday retail sales grew 7.9% vs 5.5% last year. However, other surveys suggest consumers are still spending selectively. Even after an essentially flat year for stocks, US household wealth is near record levels ($83 trillion). 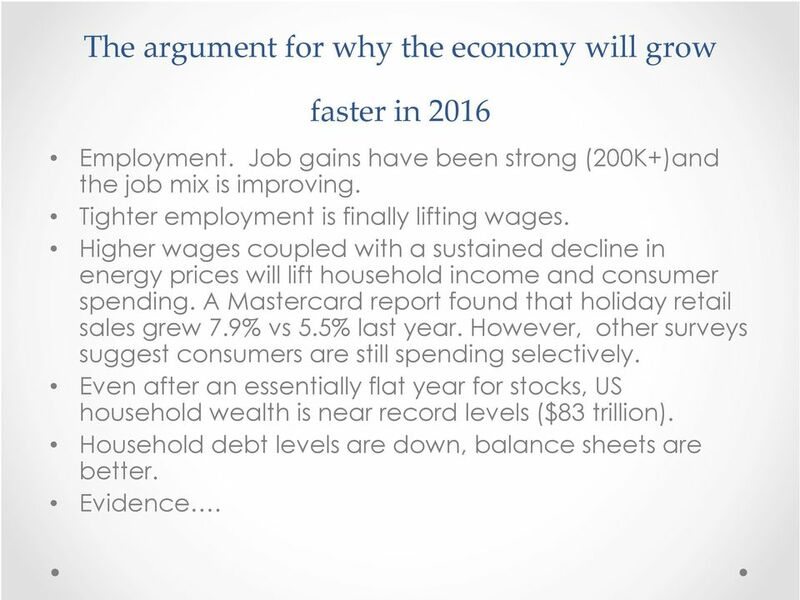 Household debt levels are down, balance sheets are better. Evidence. 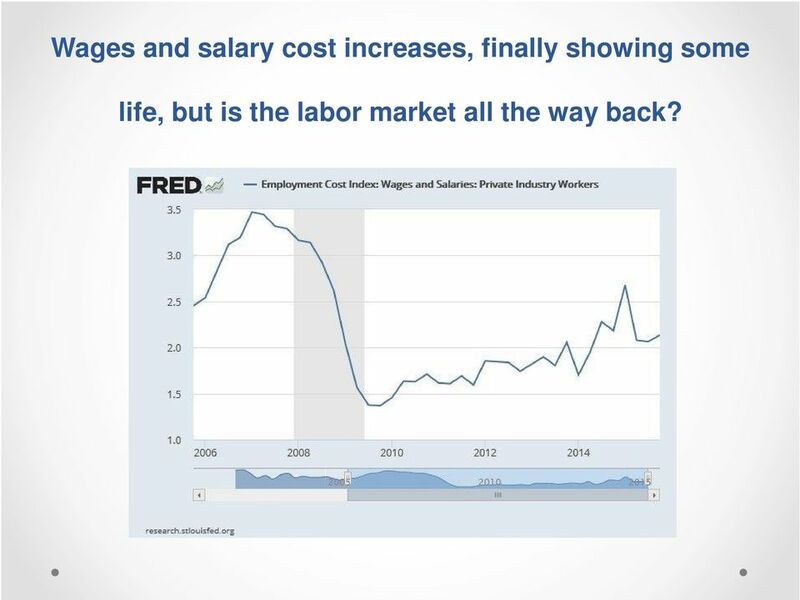 5 Wages and salary cost increases, finally showing some life, but is the labor market all the way back? 11 What might tip the balance? Housing. 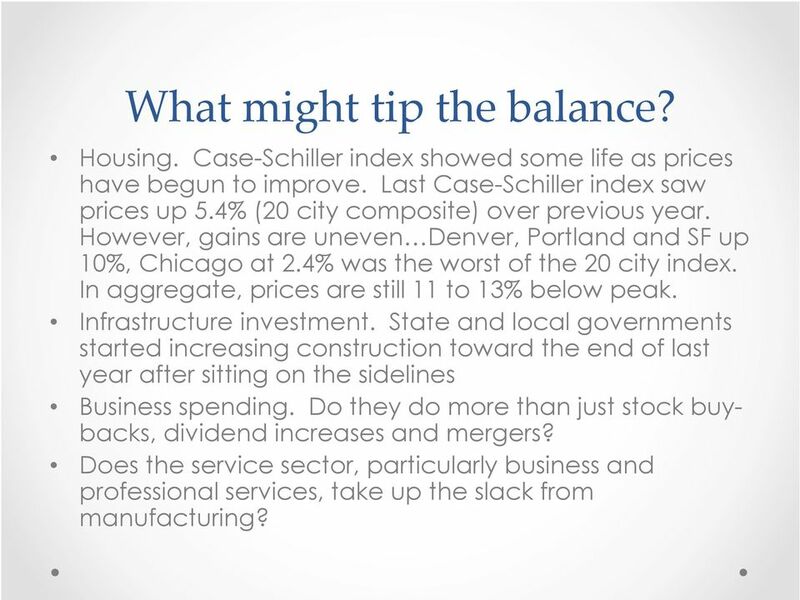 Case-Schiller index showed some life as prices have begun to improve. Last Case-Schiller index saw prices up 5.4% (20 city composite) over previous year. 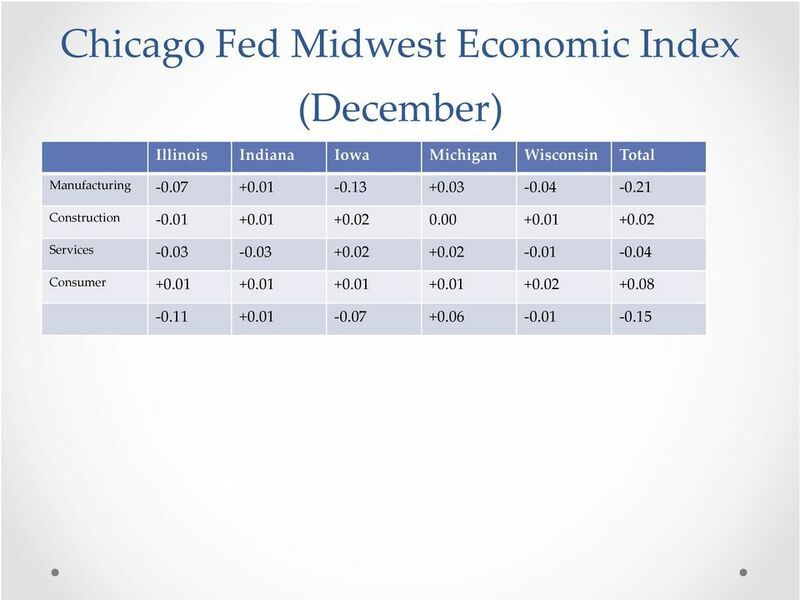 However, gains are uneven Denver, Portland and SF up 10%, Chicago at 2.4% was the worst of the 20 city index. In aggregate, prices are still 11 to 13% below peak. Infrastructure investment. 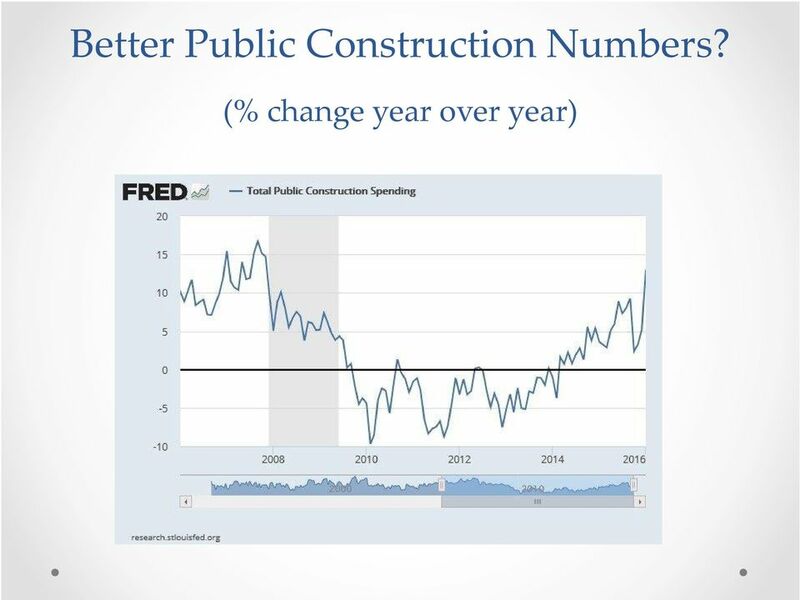 State and local governments started increasing construction toward the end of last year after sitting on the sidelines Business spending. Do they do more than just stock buybacks, dividend increases and mergers? 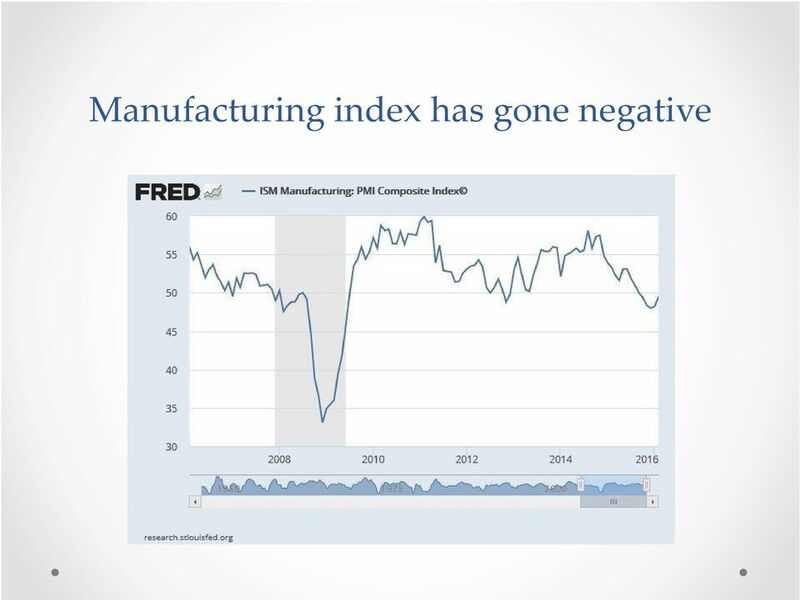 Does the service sector, particularly business and professional services, take up the slack from manufacturing? 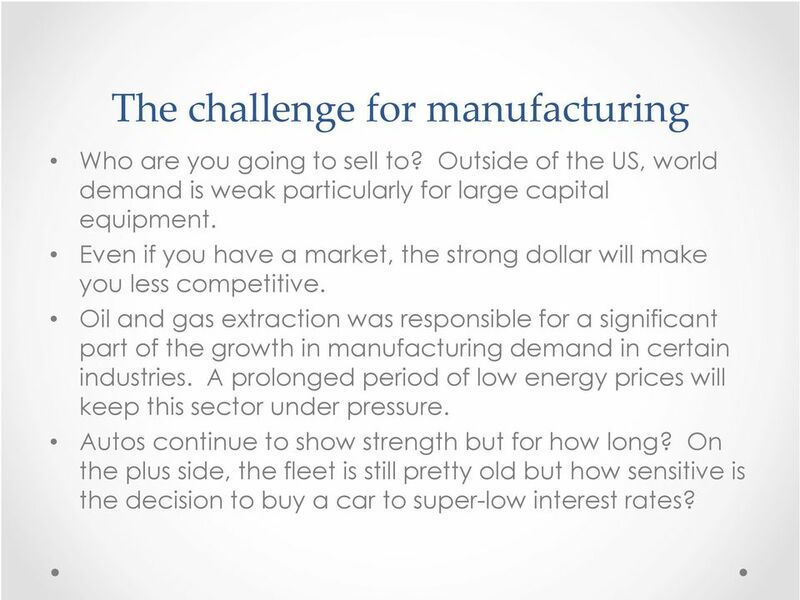 15 The challenge for manufacturing Who are you going to sell to? 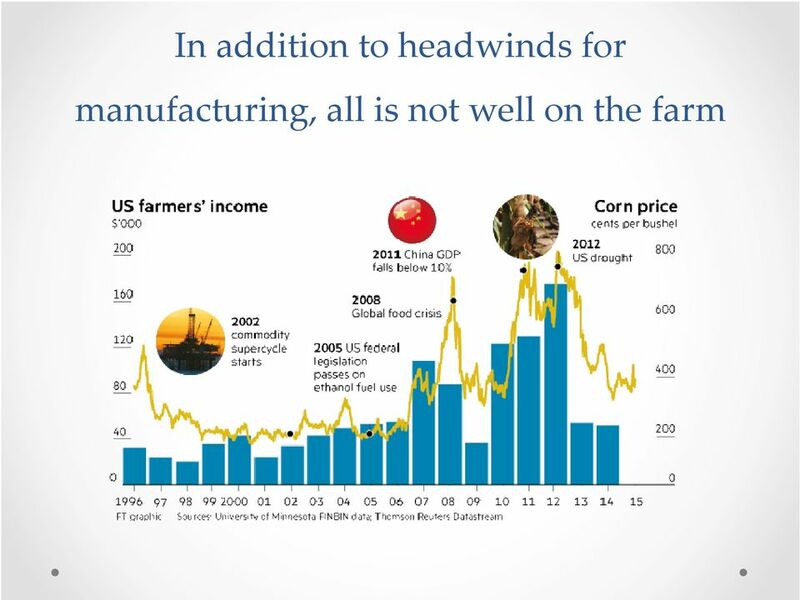 Outside of the US, world demand is weak particularly for large capital equipment. Even if you have a market, the strong dollar will make you less competitive. Oil and gas extraction was responsible for a significant part of the growth in manufacturing demand in certain industries. A prolonged period of low energy prices will keep this sector under pressure. Autos continue to show strength but for how long? On the plus side, the fleet is still pretty old but how sensitive is the decision to buy a car to super-low interest rates? 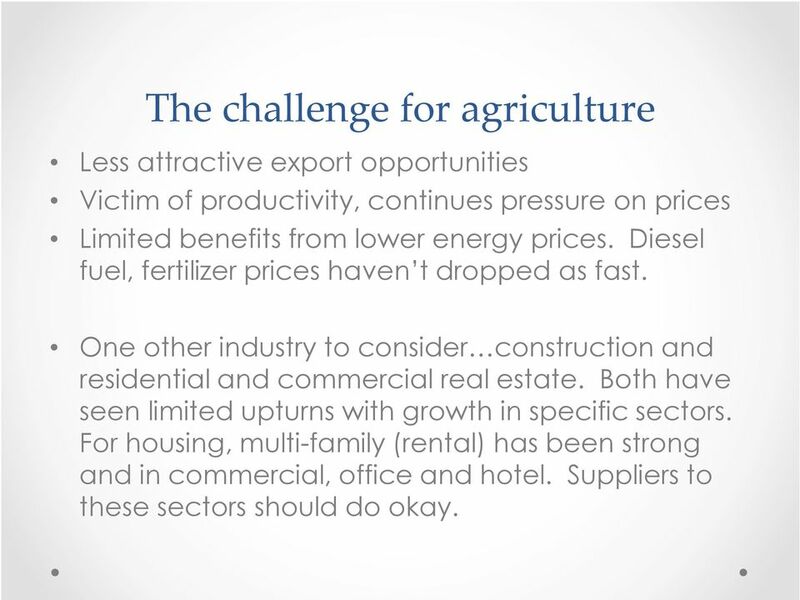 16 The challenge for agriculture Less attractive export opportunities Victim of productivity, continues pressure on prices Limited benefits from lower energy prices. Diesel fuel, fertilizer prices haven t dropped as fast. One other industry to consider construction and residential and commercial real estate. Both have seen limited upturns with growth in specific sectors. For housing, multi-family (rental) has been strong and in commercial, office and hotel. Suppliers to these sectors should do okay. 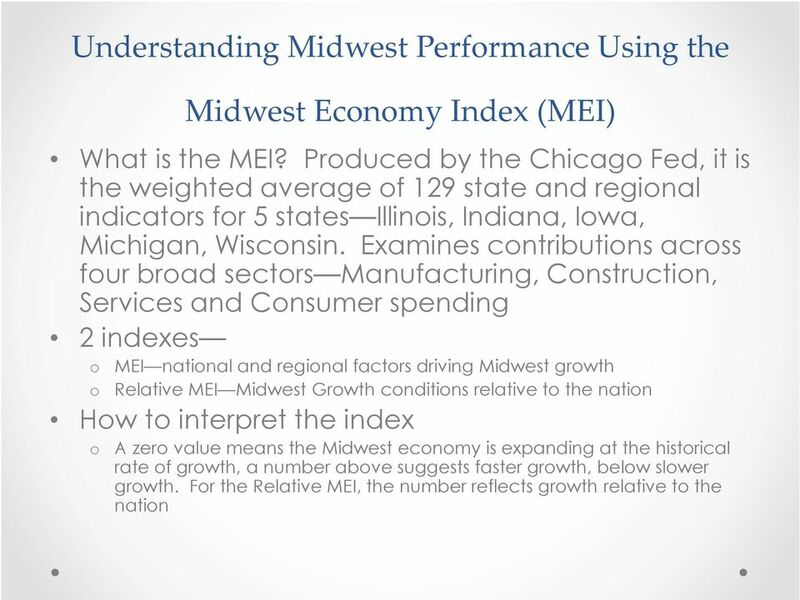 20 How have Midwest states performed over the Business Cycle? 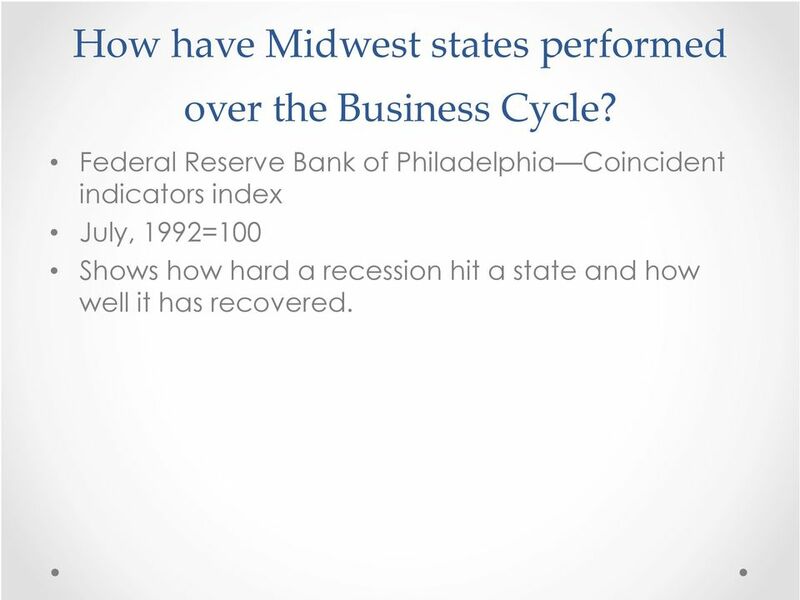 Federal Reserve Bank of Philadelphia Coincident indicators index July, 1992=100 Shows how hard a recession hit a state and how well it has recovered. 23 One final observation-- competitiveness Figure 1. 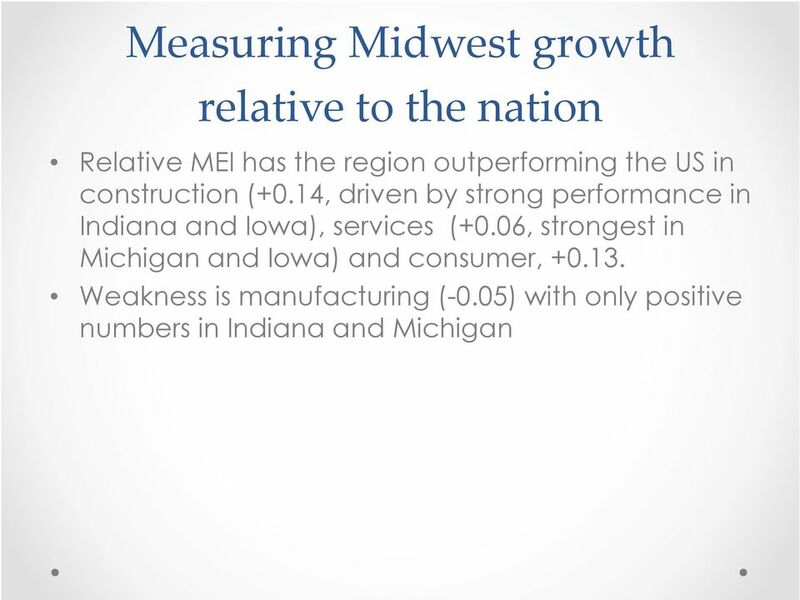 State Financial Position Index and Competitive Posture (Price Waterhouse Coopers, 2015) 2014 Relative Taxpayer Burden/Income Ratio* 2014 Relative Retirement Obligations Burden/Surplus Ratio 2015 Competitive Posture Quartile (1=best) 2014 Net Domestic Migration US Median % US Mean % Illinois % Indiana % Iowa % Michigan % Wisconsin % *The ratio is calculated as total net financial assets and liabilities and unfunded retirement balances divided by the numberoffederal taxpayers in that state. This is then compared to the real median household income for the state. The tax payer surplus/burden is divided by the real median household income to get the Relative Taxpayer Burden/Surplus ratio. 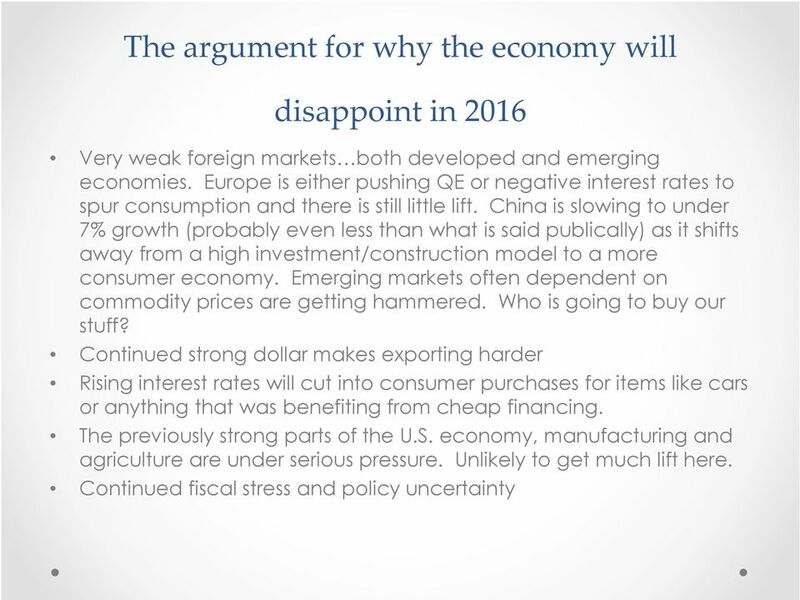 24 Summary 2016 will see growth but it will only be moderate Big question is where will demand come from? 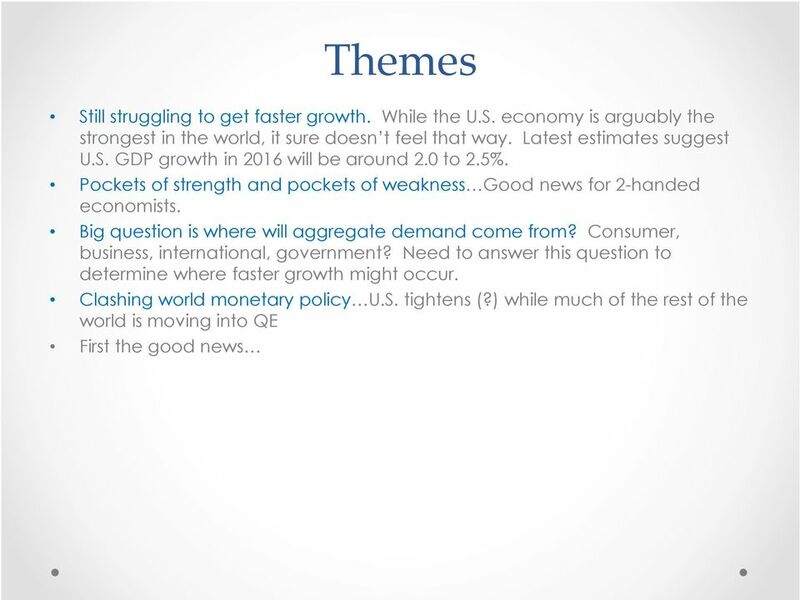 Second big question is how interest rate sensitive is the economy? 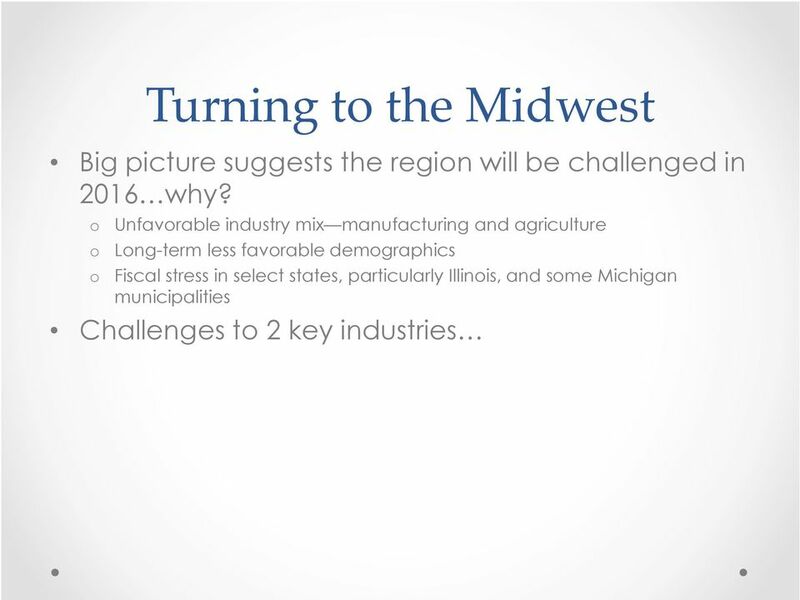 For the Midwest, industry mix will provide challenges Suppliers to manufacturing and agriculture will be pressured Suppliers to real estate may do okay but recovery in the sector is uneven. Commercial real estate still favors big cities for growth as firms chase millennials. ECONOMIC COMMENTARY Capital Investment in Alberta is Anticipated to Decline in 2015 Highlights: Capital investment has been the largest contributor to Alberta s economic growth since the mid-nineties. Quarterly NEWS. 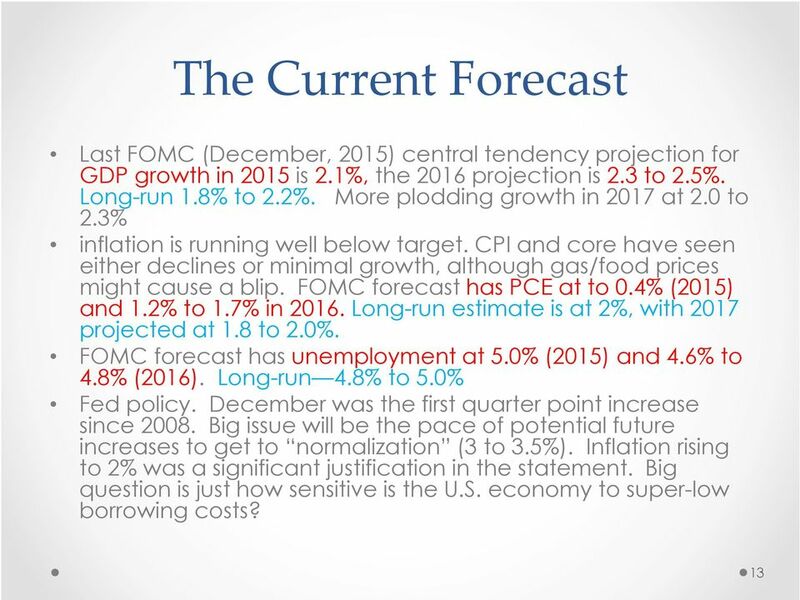 Is Inflation Around the Corner?